Located just west of Colorado Springs by the base of Pikes Peak, little Manitou Springs is a charming town founded in the late 1800's. In fact, Blue Skies Inn is located on the historic streamside Briarhurst estate built by Dr. William Bell, the founder of our city. 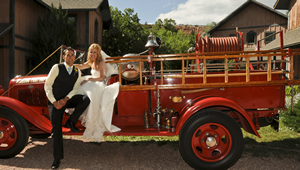 Blue Skies Inn hosts the perfect wedding for the bride and groom who choose an intimate wedding of 100 or fewer guests. Our romantic, secluded bed and breakfast inn will provide the perfect setting for the wedding and honeymoon of your dreams. 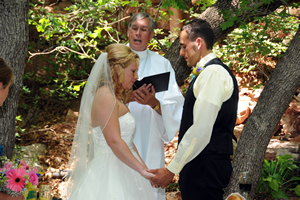 Blue Skies Inn celebrates Garden & Chapel weddings all year.